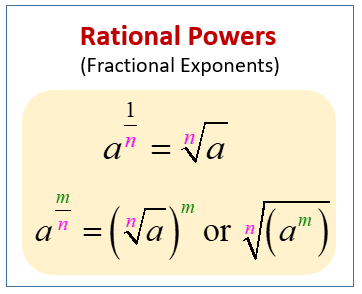 Examples, videos, worksheets, solutions, and activities to help Algebra 1 students learn about Fractional Powers, Fractional Exponents and Rational Exponents. The following diagram shows how to convert between rational powers and radical notation. Scroll down the page for more examples and solutions of rational powers. Many examples of evaluating numbers raised to fractional exponents are shown along with the general rules. Understand how powers that are fractions work in this quick and easy video.